Eating a plant based diet can be a fulfilling and delicious approach to a healthy lifestyle. Studies have found that cutting back on animal products, even just a few times a week, can lead to reduced disease and other health issues. Eating a more green diet also has a positive environmental impact. That’s why we’ve developed our Vegetarian meal plans. Finding recipes and planning meals for a vegetarian or vegan diet can take more work, because meat and dairy-based meals are so prevalent in the US. It can also be challenging to find recipes and meal plans that offer the right balance of nutrition. Good news for veggie lovers, The Dinner Daily has your back. Vegetarianism is becoming widely embraced in the United States and at the Dinner Daily, our vegetarian meals are just as delicious as those with animal products. With The Dinner Daily, it’s easy to add 1-2 vegetarian dishes to any weekly meal plan, so members can embrace “Meatless Mondays”. But for dedicated vegetarians, The Dinner Daily offers full vegetarian meal plans of 5 meals per week, including sides. Our creative and experienced dieticians recently developed a whole new bank of vegetarian recipes. Our recipes go far beyond the typical Meatless Mondays meals and include lots of variety and use of healthy and nutrient dense ingredients. When we launched our completely personalized food and dietary selections last fall, we also made it easy for Vegans to begin using The Dinner Daily. With these selections, each week you’ll receive a five-dinner meal plan with main courses and sides that will meet most Vegans’ needs. There may still be a few ingredients that most Vegans eat, but some do not, such as honey, but those ingredients are not widely used and any recipes with those ingredients can easily be swapped for something else with our “Switch It” Feature. Watch a demo below to see how easy it is to customize our weekly meal plans. If you are a Flexitarian, Vegetarian, or Vegan and need help organizing meal plan and would benefit from getting a new menu each week based on the fresh vegetable and fruit sales at your store, check out The Dinner Daily. Click here to see one of our vegetarian recipes. 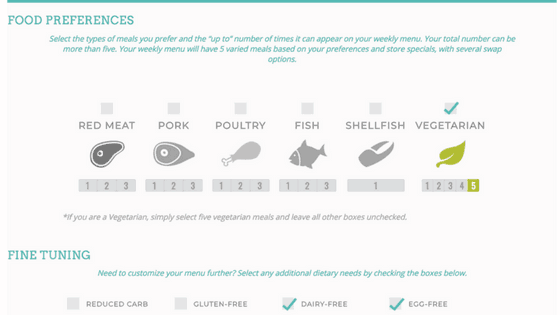 Try our Vegan & Vegetarian Meal plans for two weeks for free!